Every gate you see on this website is made in our own workshops…by Joiners; not only does this give us control over the quality of every single gate that leaves us for its new home, but it also gives us great flexibility to enable us to make YOU the gate that you want…so why not customise your gates? Fitting to existing hinge positions – you may need bigger horizontal rails! Our gates are similar to what you want but not quite…..
Do you want a gate that looks the same from both sides, a double sided gate so you cannot see the rear framing of the gate or the diagonal bracing? Then want no more! All of our gates can be supplied as double boarded gates. These are great if you want to avoid seeing the framework of the gates each time you use them and are especially useful if you have young children who try and climb the rear of the gates; with no rails visible on the rear of the gates, there is nothing to give your children a foothold, thereby, making it harder for them to climb the gate and risk injury. Other than the gates being double sided, they are manufactured to the same high standards you have come to expect from our products; all the additional rails and diagonal braces are still present, they simply cannot be seen! 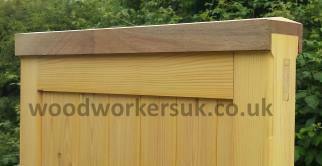 The left image shows the rear of a normally boarded Curved top gate, whilst far right, shows the rear of a double boarded / double sided gate. Although the rails and diagonal bracing cannot be seen on a double boarded gate, they are still present, giving additional strength. 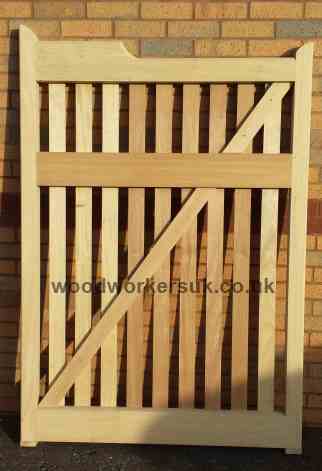 The majority of the gates pictured on our website are shown as close boarded gates (i.e. you cannot see through the boarded section of the gates. Every gate is available as an open boarded gates (i.e. you can see through the boarded section). 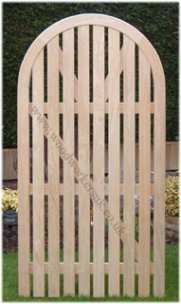 Here we show you examples of both types of gates in the style of our Arched gates. Open boarded or close boarded gates? We make the gates exactly the same way whether we make an open boarded or close boarded gate, the only difference is the way they look. 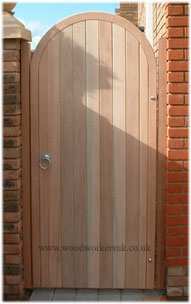 Why choose a close boarded gate? Choose a close boarded gate if you want to keep prying eyes out or, for example, if you’ve a dog that is prone to bark at whatever it can see going past (if they can’t see it, they cannot bark at it!). We make and supply quite a few close boarded gates to people who do have snappy dogs who are worried about passers by sticking their fingers through the gates and getting bitten. Why choose an open boarded gate? 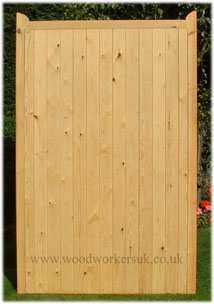 Open boarded or slatted gates are great if you live in a windy area, as they allow the wind to pass through the gates. 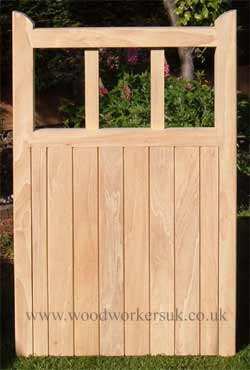 Larger close boarded gates can be difficult, at times, to open into a strong wind; you run the risk of the wind dragging them out of your hands; with an open boarded gate, this can be greatly reduced. So they make a good option if you do live in a windy area and privacy is not your greatest concern. Unequally split gates – One gate bigger than the other. After a pair of driveway gates? Got some kind of obstruction in the way meaning a 50/50 split pair would be of no use to you? Or maybe you don’t need to open one of the gates all the time and want a smaller pedestrian gate to use the majority of the time, with a larger gate next to it that will only be used now and then? In that case, you’re after a pair of unequally split gates! These are great if, for example, you’ve got a caravan or trailer that you want to keep locked away behind your gates, but still want to allow pedestrian access through the gates (just remember to combine the larger gate with a lockable dropbolt for added security). The added benefits of these are that if you only really use the gate to walk through (or even ride a bike or motorcycle) then you’ve not got the extra effort involved in opening a large gate! 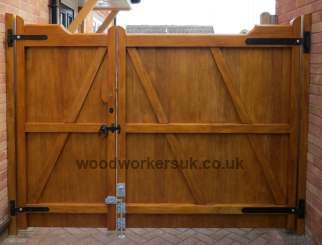 All our driveway gates with straight tops (Denbigh, St Asaph, Harlech, Nannerch) can be made with one gate larger than the other. We can also do this with any of our shaped gates (Beaumaris, Caernarfon, Colwyn etc), however, due to the unequal split, whatever height rises on the gates will look different between the smaller gate and the larger gate. We have a range of gates that have a ‘vision panel’ section in the top; these contain vertical uprights and these too can be customised. Want a few extra uprights, maybe want to add a horizontal piece in there as well? No problem! Adding a horizontal bar into the top section tends to work and look best on our St Asaph gates, in a gate with a shaped head (Caernarfon, Harlech & Bala) there is a tendency for the rail to ‘fight’ against the shape of the top rail/head. You can also, if you wish, add extra vertical bars into the top section. In our standard gates, these are equally spaced with gaps between the uprights of no greater than 200mm (approx 8″), but if you want to add more, please get in touch! Fitting your gates to existing built in hinge pins and worried that if you do buy a new pedestrian or pair of gates, that you won’t be able to line the hinges up with the gate rails? Worry not, we can make our gates to suit your current hinge positions! It’s simply a case of taking measurements to both the underside of the bottom hinge and underside of the top hinge, whilst the hinges are in place on the hinge pin. If you’re fitting a pair of gates to your opening and the hinge pins are built in on both sides, then it is important to check each side of the opening, as there can be differences in the measurements; in which case, it can be best to make the gates with wider rails than usual (145mm wide rather than our usual 70mm) as this will give you a bit more room to maneuver to adjust the gates when hanging them. You can find out a bit more info on measuring up for gates to suit existing hinge pins in our ‘How to measure up for gates‘ section. Can you make the gates without the pointy bits (joggles) on the top? If you’ve browsed through our gates, you may well have noticed that, in the main, they all have protruding joggles (or pointy bits!) on the top corners. These sit above the top rail of the gates by approx 65mm / 2 1/2″ and are there for a very important reason as they give the top through, wedged, mortice and tenon joint strength. In short, yes we can, although on overly large gates or gates that are being automated, then no, as the joint will lose some strength. Also, to stop the build up of water on the top rail of the gates, a cover strip with a weather angle will also be added. If you want a gate without the joggles, then it has to be made this way. Do not buy a gate with joggles then cut them off! You can find out more on this on our Postern gates section and also on our Denbigh pedestrian gates page. 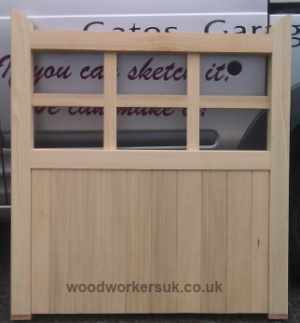 Shown is our Denbigh gate in Softwood with a wraparound capping. The capping is shaped to avoid moisture build up and will make for a longer life for the gate. 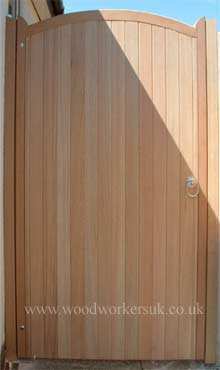 As the gate is Softwood, the capping is in Meranti to further add to the lifespan of the gates. 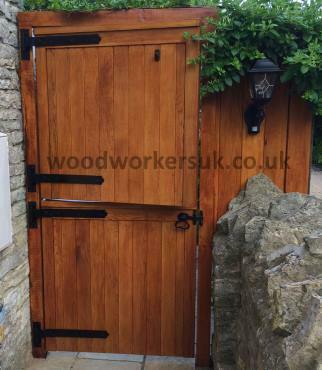 Stable door style gates – these are quite unusual but that said we have made a few sets of these since the original picture was used on our website. Apparently these are quite common in Holland, and this is where our customer who we first made this from had seen them. As both gates have flat tops, these have the cappings previously mentioned above. I believe the original gates were required to let light into a small walled garden by using the top section open in the daytime. The bottom section being closed lets our customers dog roam freely in the garden. Seen a gate that is nearly what you want…..but not quite? You may not want to go the whole way and design your own bespoke gate and something from our standard range of gates may not be exactly what you want, but you may have seen our Beaumaris driveway gates and think that’s exactly what you want, if only the top rail rose a little bit less than the 150mm (6 inches) standard, for example? Or you’ve seen our Caernarfon gates and they’re spot on, apart from the number of uprights in the open ‘vision’ panel section? No problem! As everything we manufacture is made to order/ made to measure, we can adapt our standard designs of driveway and pedestrian gates to your own exact requirements! It’s no longer a case of ‘that’s near enough’; after all, once purchased and fitted they’ll be the first thing you see each day as you arrive home, so why settle for ‘near enough’?! 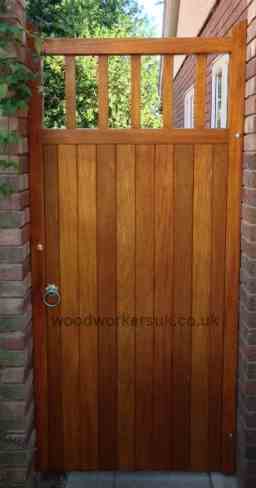 Below, is just one example of how our gates can be customised to your requirements. A recent customer liked both our St Asaph and Curved headed pedestrian gates and wanted a cross between the two; take one of our St Asaph gates and one Curved headed gate and you end up with…… a St. Curved gate or a Curved Asaph gate! It doesn’t matter what you call the gate, in short, you get the gate that you want! and you end up with…… a St. Curved gate or a Curved Asaph gate! 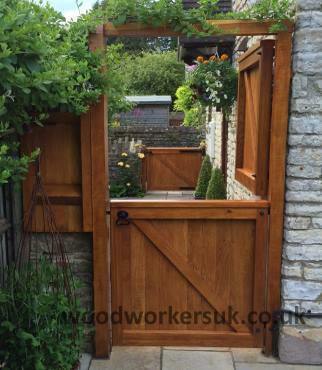 All the wooden gates on our website can be customised to your requirements; if you’ve seen something that you like on our website then please contact us, either by telephone or Email, for a full personalised costing. 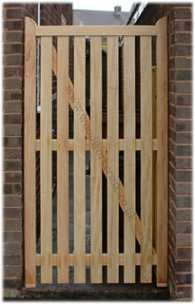 If you have your own gate design in mind and there is nothing similar on our website, then please visit our bespoke wooden gates page for details of the information we require in order to provide a costing and manufacture the gates. Everything on this page are examples of what we can do. If you’re after something specific that is not mentioned here, then again, please get in touch with us and we’ll see what we can do for you. Please do bear in mind that in most cases ‘customising our gates’ to your requirements will more than likely increase the cost from something in our standard range of gates. Obtaining a personalised costing on any of our driveway gates couldn’t be easier, you can either use the contact form below (or on any of the individual driveway gate pages), give us a call us on 01745 362444for an immediate costing or pop into our workshops in Rhyl, North Wales. 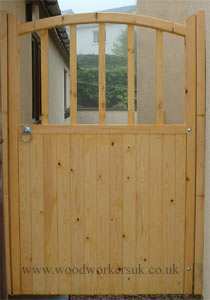 As Postern gates – Fitting your gate into an enclosed opening? Then please see our Postern gates page for more information. Manufactured to your own designs – Got a sketch or drawing of a gate design you require? Then please see our Bespoke gates page for more information on bringing your design to life!. To suit automation – We manufacture our gates differently depending on the method of automation used for more information please visit our gates to suit automation page.